Background Research indicates that body dissatisfaction is correlated with and often predictive of both physical and mental health problems. “Fat talk,” a well-studied form of body image talk in adolescents and university-aged women, has been implicated as contributing to body dissatisfaction and mediating the relationship between body dissatisfaction and other mental health problems. Limited research, however, has investigated fat talk across the female lifespan. Further, consistent with most body image research, fat talk research solely focuses on the thin dimension of idealized female attractiveness, even though other dimensions may contribute to body dissatisfaction in women. Method The current study investigated whether or not “old talk,” a hereto un-described form of body image talk, appears to be a parallel, but distinct, form of body image talk that taps into the young dimension of the thin-young-ideal standard of female beauty. An international, internet sample of women (aged 18-87, N = 914) completed questionnaires aimed at assessing fat talk, old talk, body image disturbance, and eating disorder pathology. Results Results indicated that both fat talk and old talk were reported by women across the lifespan, although they evidenced different trajectories of frequency. Like fat talk, old talk was significantly correlated with body image disturbance and eating disorder pathology, albeit at a lower rate than fat talk in the total sample. Old talk was more highly correlated with ageing appearance anxiety than fat talk, and the correlation between old talk and body image disturbance and ED pathology increased with women’s ages. Conclusion Results suggest that old talk is a form of body image talk that is related to but distinct from fat talk. Old talk appears to be similarly problematic to fat talk for women whose age increases their deviation from the thin-young-ideal. Further research into the phenomenon of old talk is warranted as is increased attention to fat talk across the full lifespan of women. Becker, C. B., Diedrichs, P. C., Jankowski, G., & Werchan, C. (2013). 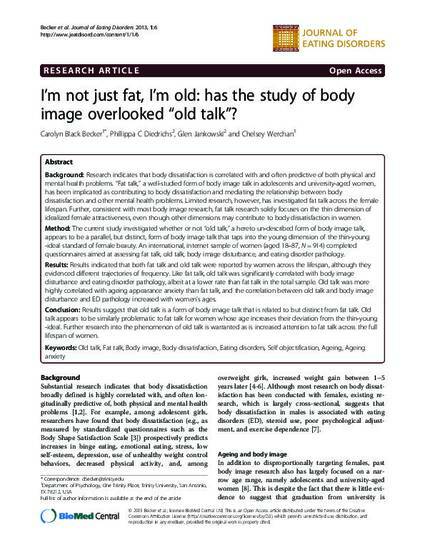 I’m not just fat, I’m old: Has the study of body image talk overlooked “old talk?” The Journal of Eating Disorders, 1(6), doi:10.1186/2050-2974-1-6.